As a happy pedestrian and occasional cyclist, I’m always glad to visit parks when I’m travelling in cities. But in Colorado Springs, their definition of a park is a little different from mine. I’m used to the expansive lawns, as I experienced at Boston Common or the planned displays of cacti at the Phoenix Botanical Gardens. Even the beachfront landscaping of Grenada’s Mount Cinnamon had a natural yet tamed collection of palm trees, seagrape trees and boungainvillea. But in Colorado Springs, this part of the state thinks of a park a little differently. 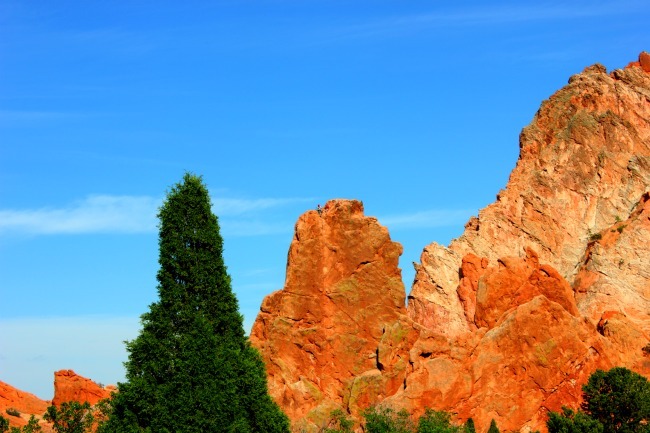 Thanks to an old city ordinance, wealthy landowners were encouraged to create parks, and the Garden of the Gods went from private land to park land for this city. Its a prime example of the local landscape – cactus, sagebrush and wildflowers happily surviving in the dusty, red clay soil and small red rock mountains, prime candidates for hiking and rock climbing. But like any park, there were people walking, cycling, and skateboarding as well as exploring up, close and personal. Looking at the photo above, you may be able to see a climber, happily sitting on top of the small mountain. This unconventional city park expanded my definition and made me glad to be able to see the red rock – the unique colour hues are a bucket list must for traveller’s who love the desert aesthetic. And it solidified my commitment to visit the city park – who knows what I’ll discover next thanks to Mother Nature.